It is no surprise with Europe’s open door policy and a Mayor that is a supporter of Islamic Extremism that the UK is now under serous threat from ISIS and other Muslim groups. Britain was flooded with “refugees” as weak politicians and sinister forces like Sadiq Khan cried racism at every attempt to stem the slow of Muslim Immigrants, now Britain itself is in danger. Terror Groups like Cage operate freely with the support of Government in Britain, Mayor Sadiq Khan has stated the “Terrorism is just part of living in a big city”. Britain is being crushed under the weight of Muslim Immigrants refusing to assimilate, politicians to weak and cowardly to take a stand, and Mainstream Media that is so liberal nothing Anti-Islamic can be published. Britain’s top domestic intelligence officer has warned that Britain is under unprecedented threat from Islamist terrorists, and says that 20 plots have been foiled in the past four years, while future successful attacks are inevitable. “The threat is more diverse than I’ve ever known. Plots developed here in the UK, but plots directed from overseas as well. Plots online. Complex scheming and also crude stabbings; lengthy planning but also spontaneous attacks. Extremists of all ages, gender and backgrounds, united only by the toxic ideology of violent victory that drives them,” said Parker, who has headed MI5 since 2013. Thirty-six people have been killed across the UK in four separate jihadist attacks in 2017, including a suicide bombing in Manchester in May said was not and two deadly vehicular attacks in London, and Parker said that it was impossible for the agency to monitor every threat, or prevent every incident, noting that the Salman Abedi, the man who killed 22 people with a homemade nail bomb, was not even on any extended terror list. The MI5 chief said that the did not want to be seen as “King Canute trying to hold back the tide of developing technology” but said that Facebook, Google, Amazon and other internet giants had an “ethical responsibility” in combating terrorism. “No company wants to provide terrorists with explosive precursors. Social media platforms don’t want to host bomb making videos. And communications providers don’t want to provide the means of terrorist planning, beyond the sight of MI5,” said Parker. Until 2017, Great Britain had been spared the kind of atrocities which have occurred across the rest of Europe, as well as the US and the Middle East. Even with the Lee Rigby murder and several killings committed by far-right extremists, since the 7/7 bombings in 2005, which killed 56 people, the UK had been relatively peaceful. This year, however, Britain has suffered five major terrorist attacks, four of which have been claimed by Islamic State (IS, formerly ISIS/ISIL). Six people were killed, including the attacker – radicalized British citizen Khalid Masood – after he ploughed a rented car into a crowd of pedestrians on London’s busy Westminster Bridge, a popular spot for tourists. He then crashed into the railings at the perimeter of Westminster Palace, got out of the car, and proceeded to stab police officer Keith Palmer to death before being shot dead by armed officers outside Parliament, prompting the evacuation of Prime Minister Theresa May, with MPs under lockdown. Victims of the Westminster Bridge attack included British, American, and Romanian citizens. Around 50 people were injured. Later, security services uncovered the final message he sent in WhatsApp, reportedly saying he was waging jihad in revenge for Western military action in the Middle East. The slaughter came on the anniversary of a jihadist attack on the Belgian capital in 2016. Twenty-two people were killed and 116 were injured in a suicide bombing carried out by Salman Abedi, a 22-year-old British national of Libyan origin. A shrapnel-laden homemade device detonated as people were leaving a concert by American pop star Ariana Grande. The vast majority of those killed or injured were children and their parents who were attending the concert, the youngest of which was Saffie Roussos, 8, from Lancashire. The number of fatalities made the bombing in Manchester Arena the deadliest attack of its kind in the UK since 2005, when a series of blasts rocked the London public transport network, which left 52 people and four perpetrators dead. One of the survivors of the 2005 attack, Tony Walter, took his life shortly after the atrocity in Manchester, reportedly growing distressed by the string of deadly attacks. Ariana Grande went back to Manchester in June, visiting survivors in the hospital and headlining a charity concert to raise money for the victims and their families, which included such stars as Robbie Williams, Katy Perry, Miley Cyrus, Coldplay, Justin Bieber, and Pharrell. A third attack in three months shook the British capital in June, when eight people were killed and 48 others were injured. Three assailants veered a rented van off the road at London Bridge, mowing down pedestrians at high speed. The group, wearing fake suicide belts, then turned to nearby Borough Market, abandoned the vehicle, and went on to stab people at random in pubs and restaurants before being shot dead by armed officers eight minutes after receiving an emergency call. A number of pub patrons fought back during the attack, throwing bottles and chairs at the terrorists. One of them, 47-year-old football fan Roy Larner, charged at the three machete-wielding assailants yelling “F*** you, I’m Millwall!” Amazingly, Larner survived the ordeal, but had to be treated for multiple stab wounds. A crudely-constructed improvised explosive device (IED) failed to fully detonate on a crowded passenger train during rush hour in London, killing no one, though 29 people were injured. IS claimed responsibility for the attack through its propaganda wing – Amaq News Agency, saying the group’s ‘detachment’ had carried it out. 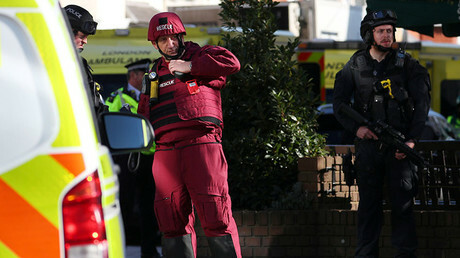 Police and security services have launched a manhunt, with hundreds of military servicemen deployed to free up police. The attack could have been carried out by domestically radicalized people, former Pentagon official Michael Maloof believes. Speaking to RT, he said that there is anticipation of further attacks in Europe, given the wave of terrorism that has recently hit the region. “It is not only returning jihadists, but radicalized people who never probably got to the battlefield,” Maloof told RT. People should go back to daily business, because “if they don’t then, then the terrorists will win,” he said. However, people should stay vigilant and report anything suspicious, as terrorists choose “soft targets” and places with low security to cause maximum damage. “To see an object sitting in the tube and no one said anything is bizarre to me, given the heightened awareness they should already be exercising. The fact that it was not reported to authorities is troubling,” Maloof said.